"Sand Island, Baker Bay, Washington"
Click image to enlarge Sand Island at Baker Bay. Image taken April 19, 2005. Sand Island, Washington, is located in Baker Bay across from Ilwaco, Washington and Point Adams, Oregon. Cape Disappointment is located to the west of Sand Island. It was often depicted as "Sandy Island" on early maps. 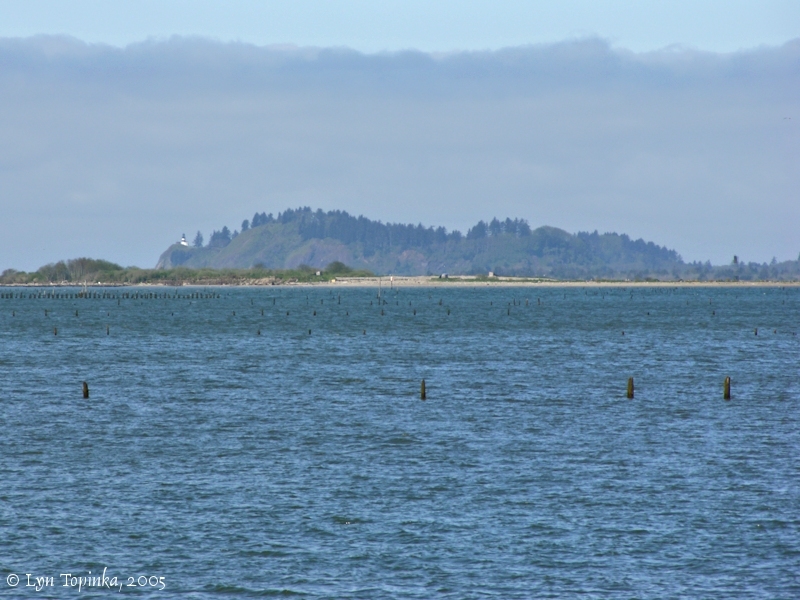 Good views of Sand Island can be had from Chinook Point on the east side of Baker Bay, and from the boat dock below Cape Disappointment. Moulton (Vol.6) states that Sand Island does not appear on Atlas maps 82, 91, or fig. 1 in volume 6, and that lines have been drawn vertically through the paragraph in the rough draft. 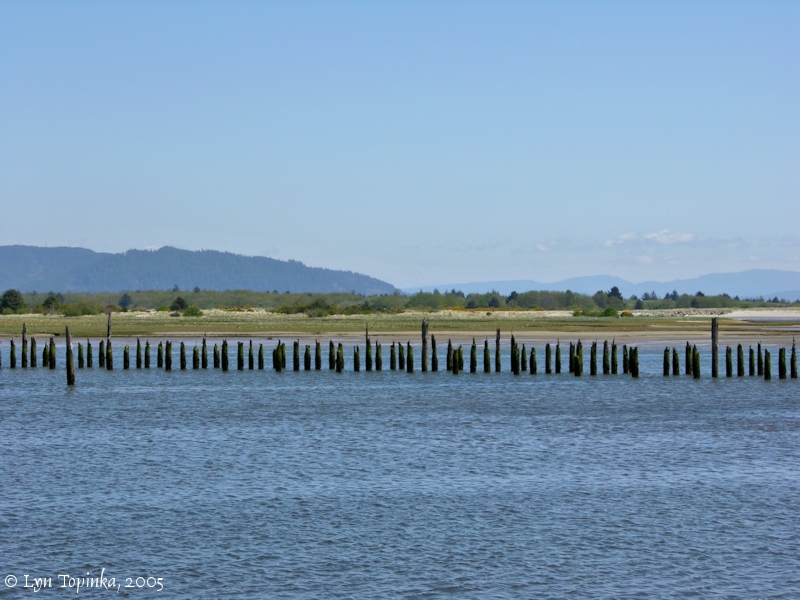 In May 1792 Captain Gray's journals make no mention of an "Island" at the entrance of the Columbia River. In October 1792 Lieutenant Broughton of the Captain George Vancouver Expedition, mentions "Spit Bank" in the Sand Island area. "... Sand Island is nearly a mile to the westward of its position in 1841; ... On Sand Island, a beacon was constructed in June, 1850, having on it a while flag, 80 feet above the island, and 85 feet above high water mark. Around the base of the flagstaff is a blcok-house, 35 feet high, and 15 feet square, which can be plainly seen 12 miles off in clear weaterh. These are excellent objects when making the river. ..."
"... Sandy Island, (1851.) It is about one-third of a mile long, E.NE. and W.SW., by 250 yards in width, and consists of loose sand raised a few feet above the river, and covered with drift logs, trees, &c. To the westward of it extend two sand bars nearly a mile in length, and bare at low water. The surveys of 1839, '41, '50, and '52 show that this part of the Middle Bank has occupied one position, and will doubtless retain it. In 1792 the main channel of the river passed over this position, and a line of soundings in 5 fathoms ran across it. Considering the immense amount of huge trees coming yearly down the river, we can readily imagine a theory for its formation. A large beacon erected upon it, distinguishable outside the bar, and ranging with another on Scarborough Hill, would serve to denote the position of the north channel. From Cape Disappointment light-house it bears E. by S. 1/2 S., distant 3 1/6 miles. It received its present name from Belcher in 1839. On the Coast Survey charts it is called Sand Island. ..."
"Sand Island -- This island, the first met with after passing the bar, is about one and a quarter miles long, and is separated at high water into two parts. These two parts lie east-northeast and west-southwest of each other, and are about four hundred and thirty yards apart. They consist of loose sand raised a few feet above the river, and covered with trees, drift-logs, &c. From the western end of Sand Island a sand-bar, three-quarters of a mile long and bare at low water, extends in a west-southwest direction; and from this bare spit the great Middle Sands make out, separating the north and south channels." "... Sand Island. --- this low, sandy island is the visible danger in the middle of the entrance to the river. It lies inside the line joining Point Adams and Cape Disappointment. In 1841 it was almost abreast of Point Adams and less than one-third the width of the river from the point. In 1850 it had moved a little seaward, and was farther from Point Adams. In 1868 it was more than half-way across to Cape Disappointment but inside the line. In 1886 it had taken a shape like a boomerang with one point a mile and a quarter east of the Cape and on the same parallel, and the other point bent up the river and three miles northwest from Fort Stevens. It is about two miles long and has an average width of nearly four hundred yards. It consists of loose sand raised a few feet above the river and covered with stranded trees, drift logs, etc., brought down by the freshets. Formerly the North Channel ran around the northeast side of this island, but the shoal from its northeast side has spread towards the Chinook Shoal, which also has developed towards Sand Island, and now there is passage-way for only nine or ten feet of water in place of four fathoms. The main channel of the river passes close under the south side of Sand Island and, striking the great Middle Sands, is divided, one part moving to the south and the other to the northewest. There is a beacon built upon this island to afford ranges for vessels. During the fishing season there are sometimes net-racks and other temporary buildings on Sand Island for the accommodation of fishermen. ..."
Throughout history, being a very descriptive name, there have been numerious "Sand Islands" up and down the Columbia River, including this "downstream" one at the mouth of Baker Bay. 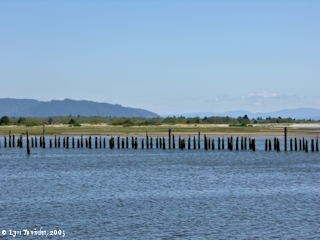 Other "Sand Islands" along the Columbia include a small Sand Island across from St. Helens, Oregon, and a Sand Island located upstream from Rooster Rock. At one point in history Tomahawk Island, just east of Hayden Island was called "Sand Island". There is also a "Sandy Island" located across from Goble, Oregon and Kalama, Washington. 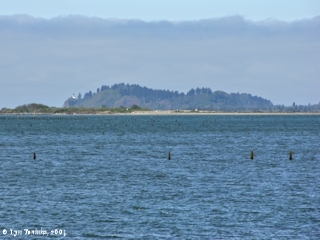 Click image to enlarge Sand Island and Cape Disappointment. View from Chinook Point. Image taken April 19, 2005. Sand Island --- compare with passage below ... Moulton (Vol.6) states "Present Sand Island, Pacific County, which does not appear on Atlas maps 82, 91, or fig. 1 in volume 6. Lines have been drawn vertically through this paragraph." as the tide was Comeing and the Seas became verry high imediately from the Ocian (imediately faceing us) [actually Baker Bay was facing them] I landed and formed a camp on the highest Spot I could find between the hight of the tides [Station Camp, McGowan, Washington, area] , and the Slashers in a Small bottom this I could plainly See would be the extent of our journey by water, as the waves were too high at any Stage for our Canoes to proceed any further down. : in full view of the Ocian from Point Adams [Point Adams, Oregon] to Cape Disapointment [Cape Disappointment, Washington], I could not See any Island in the mouth of this river as laid down by Vancouver [Sand Island, first mention by Lieutenant Broughton in 1792]. The Bay which he laies down in the mouth is imediately below me [Baker Bay]. This Bay we call Haleys bay from a favourate Trader with the Indians which they Say comes into this Bay and trades with them p Course to Point adams is S. 35° W. about 8 miles To Cape Disapointment is S. 86° W. about 14 miles.